Specially designed for TomTom 2 / 3 Series GPS Watch. Premium TPE strap+Hard PC holder, soft and comfortable to wear. Light and flexible, porous design, more breathable while doing sports. Sweat, rain, splash and water resistant, perfect for sports wear. 1. This strap is only compatible with TomTom 2 / 3 series (rectangle display), but not suitable for TomTom 1 Series (square display). 2. Due to the different displays and different lights, the picture may not reflect the actual color of the item. Thanks for your understanding. 1 * Replacement TomTom 2 / 3 Series GPS Watch Strap ( watch is not included ). 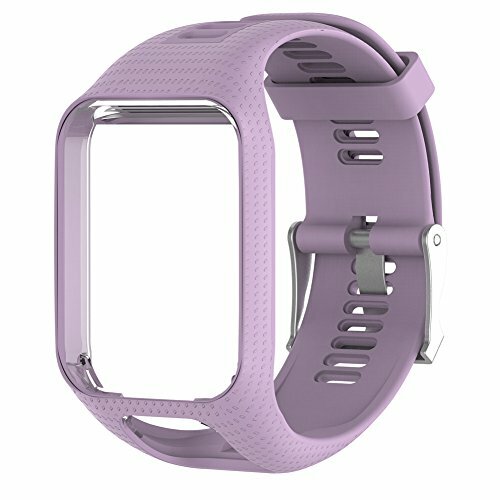 Made of premium silicone band and classic stainless steel buckle, soft and comfortable to wear. Package include: 1 * Replacement TomTom 2 / 3 Series GPS Watch Strap( watch not included ). If you have any questions about this product by HUVE, contact us by completing and submitting the form below. If you are looking for a specif part number, please include it with your message.